“Cat Tent” – Uploaded by Binary Blonde on 6th November, 2005. 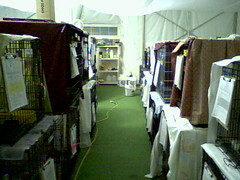 It’s half past midnight and we still need to finish our evening rounds in the cat tent, where the photo was taken. I am looking to get to sleep earlier than last night, because I am going on a rescue mission tomorrow in New Orleans. Sadly, there are still hundreds of starving animals still in the area. I am hopeful we will be successful.